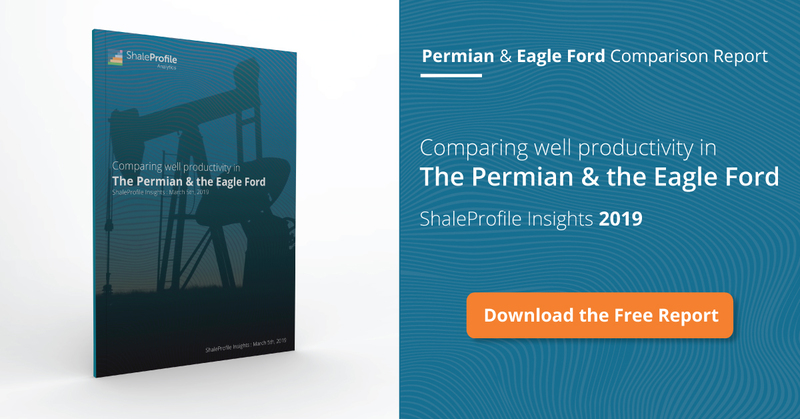 This interactive presentation contains the latest oil & gas production data from 19270 horizontal wells in the Eagle Ford region (TRRC districts 1-5), that started producing since 2010, through March 2017. After two years of declines, output from horizontal wells rose again in the first quarter of 2017, as I expect revisions will push the March numbers above those of February. New horizontal wells have been put online in 2017 at a rate of about 120 per month, which is similar to 2016, while far below the level in 2014 when almost 400 wells per month started production. The decline profiles are rather steep in the Eagle Ford; as you can see by following the top of the orange area, the production from wells that started before 2015 dropped from 1.6 million barrels of oil per day at the end of 2014, to about 400 thousand barrels of oil per day in March this year. Therefore, the underlying field decline was 75% in just over 2 years. The behavior of these wells can be clearly seen in the “Well quality” tab, where year-on-year changes appear minor, except in the early production phase. As lateral lengths increased by about 20% in the last 6 years, and proppant volumes increased on average threefold, the initial output of new wells has grown significantly. In the “Well status” map you can see the number of wells that started producing each month in the top graph. The bottom graph shows the composition of all these wells by production level; In 2012 the percentage of all horizontal wells that were producing below a rate of 50 barrels per day was below 40%. In March 2017 this has increased to 70%, with more than 40% of them below 25 bo/d. The last tab (“Top operators”) shows the performance of the largest operators. If you switch to Gas (using the “Product” selection), you can see that Anadarko, a significant producer in this area, fell to almost zero output in March. This drop was caused by the sale of most of its acreage early this year. While the wells that started in early 2011 have now hit a rate of below 15 bo/d, on average, new wells are starting with a peak rate of over 600 bo/d. I have selected only wells in the Eagle Ford formation this time (see the “Formation” selection). In the “Well status map” tab the location and status of all these wells are shown. The accuracy of these locations has strongly increased, as I now have the exact locations of more than 99% of these wells (this was about 85% in the past). On Thursday I will publish another update on the Permian. Texas RRC. Individual well profiles are estimated from well status & lease production data, as this data is not provided by the RRC. Detailed location data is available for more than 99% of the wells displayed; the remaining wells are shown near the center of the county in which they are located. I’ve no spud, DUC, or plugging information on wells & DUCs in Texas, so these statuses are unavailable. Formation data in Texas is only available on lease level; therefore, in cases where wells on the same lease are drilled in different formations, this information is not accurate. I don’t know how production from the Austin Chalk may impact all this, but EOG seems pretty optimistic that output from there using unconventional techniques could be significant in coming years.